The easy way to fill your pond with colourful plants. Plants add interest to a pond, encouraging and sheltering wildlife in the process. Helping to keep the water clear and oxygenated, they're essential for pond health. 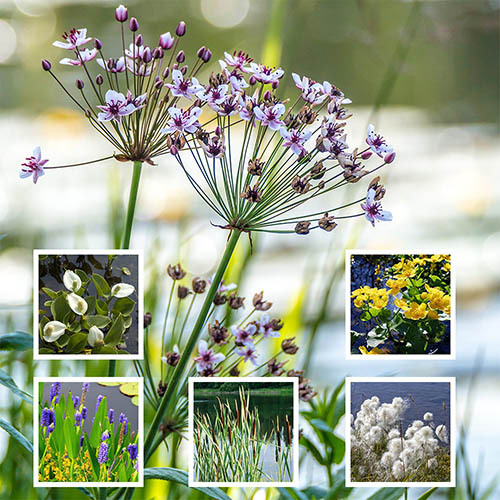 Our curated collection of hand-picked plants will help to create the perfect setting in your garden, allowing you full enjoyment of your pond as well as helping resident or visiting wildlife. The perfect way to fill your pond with colourful and functional plants with no effort at all! We've chosen a mix of 6 of the most useful plants to give you a complete range, suitable for most ponds. Curated to get your pond up and running in next to no time, this mix is perfect if you're new to ponds and are not sure where to start or if you have an existing pond and want to add more plants. Supplied as a collection of 6 plants in 9cm pots, ready to plant after the risk of frost has passed. Plants add interest to a pond, encouraging and sheltering wildlife in the process. Helping to keep the water clear and oxygenated, they're essential for pond health and choosing the right plants will create the perfect mini ecosystem in your garden. The perfect way to fill your pond with colourful and functional plants with no effort at all, our Starter Pond Plant Collection contains a mix of 6 of the most useful plants to give you a complete range, suitable for most ponds. Curated to get your pond up and running in next to no time, this mix is perfect if you're new to ponds and are not sure where to start or if you have an existing pond and want to add more plants. We've done the work for you and put together this collection to help you get the right balance in your pond. Calla Palustris (bog arum): Marginal pond plant with arum-like flowers, glossy leaves and a sprawling habit. Excellent for disguising pond edges, this hardy perennial will reach 25cm (10in) high and 60cm (24in) wide. Typha latifolia (bulrush): Marginal-shallow water plant which will thrive in up to 1m (3ft) depth of water. Grows to 1.5m-3m (5-10ft) high. Butomus umbellatus (flowering rush): Marginal to 25cm deep. An herbaceous perennial growing to 1.2m, with upright, twisted grassy leaves and stiff stems bearing heads of fragrant rosy-pink flowers. Caltha palustris (marsh marigold): An RHS Plants for Pollinators, this is a perennial plant for the pond edge with rounded, rich green leaves and clusters of deep yellow flowers 4cm (2in) in width. Eriophorum angustifolium (common cotton grass): Marginal perennial (to 5cm deep) with tufts of dark green, linear leaves, with white-hairy flower-heads in summer. Please note that varieties may change depending on seasonal availability. Supplied as a collection of 6 plants in 9cm pots, ready to plant. When planting, if you don’t have shelves in your pond for the pots to be placed on, they can be stood on bricks to raise them up to the correct height. You can plant up your pond at any time of the year, although the best time for most pond plants is late winter to early spring, just as they're starting into new growth. Plants are best planted into special aquatic containers which have mesh sides to allow water and oxygen to get to the roots of the plant. This will help restrict the growth of the plants and makes looking after them easier. Use specialist aquatic compost as this is low in certain nutrients so will not encourage algal growth. To help anchor the plant in place, add a layer of stones to the bottom of the container. Once the plant is in its new container, cover the top of the compost with a thin layer of grit to prevent the soil floating out when you submerge it. Water the pot well to settle it. Place the filled container into your pond at the correct depth - if you don’t have shelves in your pond, stand the pots on bricks to raise them up to the correct height.